There are two Pferdeschwemmen or horse wells left in Salzburg: one on the Kapitelplatz between St. Peter Abbey and the Salzburg Dom called Kapitelschwemme, and a bigger one next to the Festival Halls. The one next to the festival halls and the Neutor served the court stables that - which actually were what are now the Festival Halls, thus the name "Hofstallgasse" or "Court stable lane" for the street. Just as the stables, the Pferdeschwemme was built by Fischer von Erlach, who is also responsible for the Trinity Church, the Kollegienkirche and the Markuskirche. In any sense, von Erlach shaped Salzburg during its Baroque peak. 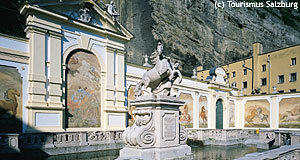 The centre of the well is decorated by a statue named "Der Rossebändiger" ("the horse whisperer" - joke, actually something like "The horse tamer"). It was made by Michael Bernhard Mandl as was originally differently oriented. In 1732, Prince Archbishop Firmian ordered the renovation of the Pferdeschwemme. The statue was shifted by 90 degrees and lifted a bit and new frescos were painted by Josef Ebner after drawings by Stradanus.